When printing banners for outdoor use, there are several things that need to be taken into consideration. Firstly, the material choice for the banner itself. Vinyl banners, or PVC banners are the best option as paper banners will be destroyed by rain and wind. Canvas banner printing is also possible but there’s no need to go to that expense, and the colours don’t come out as punchy. 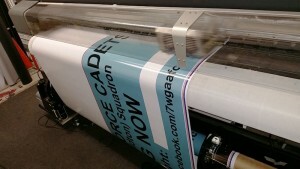 This is why we always print vinyl banners. The next item is the inks which print the image. If it’s just some simple text, some sign shops may choose to use a self-adhesive vinyl to stick to the banner. For very short term work this can do the trick, but if the banner is going to be rolled up at any stage, the letters are likely to start peeling off. Printing using an outdoor-grade, non-water-based ink is the only way to go. Our grand format printers (seen above) use these inks and can churn through your banners quickly and in crisp, high resolution. 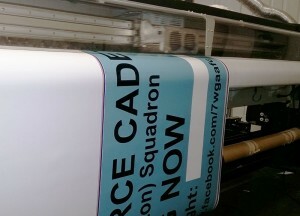 We’re sure that if you choose Banners Perth, you’ll be rapt with the results. This entry was posted in Banners and tagged Outdoor Banners Perth by Banners Perth Staff. Bookmark the permalink. I was wondering if I could request a quote for a banner for our upstairs balcony? We would be looking at a material banner with some writing and artwork on, but if you were able to come by to have a look at the space and assess factors such as wind, it would probably give you a clearer idea of what is needed. Thanks so much for your help and I look forward to hearing from you soon!